C-Line Panoramic Polypropylene Sheet Protectors are double wide, fold-out page protector. It is capable to display two 8 1/2 x 11" or one 17 x 11" sheet with a sharp, transparent clear finish. Polypropylene material offers acid-free, permanent storage that ensures no materials will lift off from the images. The heavyweight protectors offer extra durability for permanent storage of frequently used materials, the ideal product for long-term use. You're certain to find a sheet protector that meets your needs, no matter what job you're trying to accomplish. C-Line's sheet protectors are available in a variety of materials and finishes and are designed to protect your documents day after day, no matter how often they're handled. Remember, with all C-Line's top loading sheet protectors-no sheet punching is necessary. Insert Size:11 x 8 1/2"
Transcript: This is the C-Line Panoramic Fold-Out 11 x 17 inch Sheet Protectors! Now, I will start out by saying that it does stick out of binders quite a lot…Okay, I'm mostly kidding as it is a "Fold-out"—which means fold-in—protector. If you want, you can insert two 8.5 x 11 inch pages into each side. It's a tight fit, which means your pages don't slide around in the pocket. However, you can also insert a single 11 x 17 page into it. 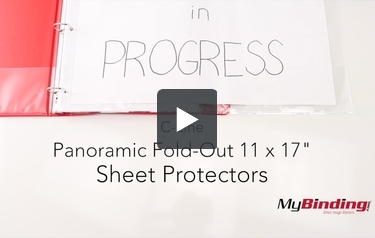 This is the C-Line Panoramic Fold-Out 11 x 17 inch Sheet Protectors! Insert one side of the page into the right pocket, then flip it over and fold the pocket. Now insert the other end of your paper into the other side of the protector. Now you have a panoramic page! If you really want, you can even put it in extra long binders, made specifically for these larger pages.